A holding solution has been determined for the Curtain Problem. I recalled that we had two natural cotton curtains that we had acquired at Glenlivet. They are pretty rammy things but will provide an interim trim for the bare window. More dye will be purchased and I’ll dye these white things and hang them up. From here on in there will be no need to draw curtains for some months, so the fact that they won’t meet in the middle won’t matter. That will give me breathing space in which to find two pairs of acceptable and economically viable curtains for the Final Curtain Solution. The too-short pair of already-dyed curtains will morph into cushion covers, or somesuch, so they will not be totally wasted. It’s just a shame that they aren’t large enough to make throws of, for the PoÃ¤ngs. I hope to get sufficient dye to allow me to dye the pink throw that covers my tatty sofa. Then we shall be fully co-ordinated. That may be the first time in my life that I have ever been able to make that particular claim! In Knitting News: I am about to carve off the thumb on my first Alpaca Warmer. I like knitting these, though tinking mistakes is sheer hell. 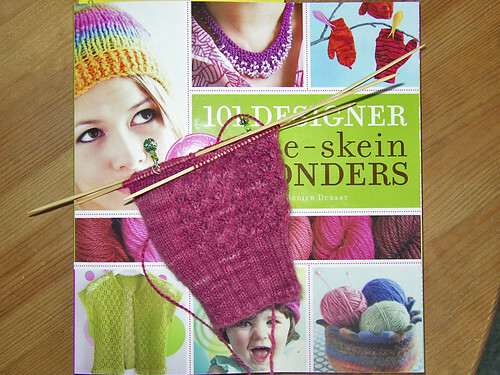 Not yet decided, but seem to be leaning towards the knitting of little fingers, if only for the experience. I don’t like the look of mitts with wee fingers and much prefer the appearance of the totally fingerless ones. I think I have enough yarn to do both and allow a compare-and-contrast exercise to be undertaken. They are going to be very pretty, whichever way that I finish them off. Craft Club News: tomorrow we are having beading demos and I don’t have to do anything but watch and enjoy! Spinning: going slowly. I’ll hope to start a new bobbin of the grey/red stuff before going to F’s on Wednesday. I don’t want to rely on Wednesday Spinning as, if the weather is kind, I’d like to cycle and would then leave my wheel at home. Migraine: Progressing nicely through Day 2 now. Hoping to go blow it away in the bay when the tide goes out. And now, back to the mitts.